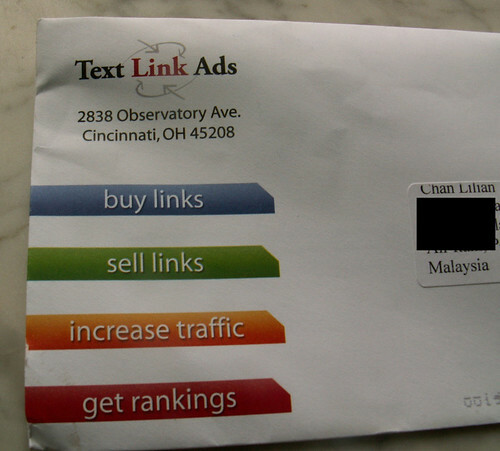 Does Text Link Ads Affiliate Programme pays? YES! I know many bloggers have put up [tag]Text Link Ads[/tag] [tag] Affiliate [/tag]referral link on your[tag] blog[/tag] but are sceptic if they really pays. I too never give much thought to referral links because my Google Adsense referral links never see any income at all. In fact, I have removed almost all my Google referral links for Adsense and also Picasa. We pay out a flat $25.00 for any referred visitor that results in a sale or gets accepted into our publisher program. You will get paid the first of every month and have the option of receiving a check or being paid via Paypal. We feature a 60 day cookie on all referrals. Many bloggers who signed up with TLA lamented that they have not sold a single link so far. Well, don’t be disheartened. I know TLA advertisers like niche blogs with specific topics. The topics do not have to be high tech and the more mundane things that the common people use, the better the chance. The second thing to note is to write a convincing sales pitch for your blog. Like for e.g. “If you have (mentioned potential products), this is the site to advertise because (mention your PR ranking, traffic and how often you update.) Target the pitch to potential advertisers and make sure you have a public stats meter for them to peek at. I know potential advertisers do pop by my sites to look-see before they buy the text link ads on my site. Another point to note is – Don’t get too engrossed reading the latest SEO gurus tips and Web 2.0 what nots because….remember, many of these advertisers are regular guys just like you and I and therefore, they still stick to the traditional method of looking at Alexa, PR and the real content of your site. So, good luck with your TLA links! i used ur link to reg for TLA … cani get the teh tarik from you already? Alex – Their service is very prompt, I like. Earl-ku – You got unique surname hor? Actually hor..after spending so much time trying to configure that TLA thingy, I found out that it only works with dedicated servers and not blogger. Kanasai! Hi, i have had a read of your blog and I have found it very useful. I have two blogs on a similar topic. Would you be interested in a link exchange? http://aglocomembers.blogspot.com (AGLOCO blog) – is less popular, but you can exchange links with that aswell if you want. If you are interested just leave a comment on my blog. 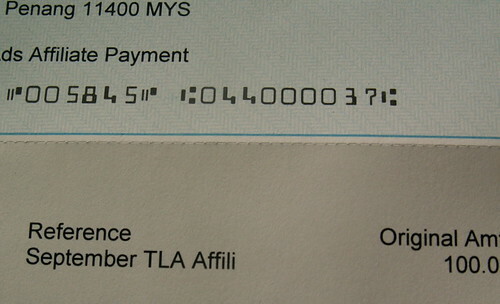 I got my TLA Affiliate Program check last week. TLA really pays for the Affiliate Program. Btw, how does LinkWorth LinkInTxt works?